Woodson State Lake - all photos by Jim Mason Hiding in the Chautauqua Hills, just a few miles northeast of Toronto Reservoir, is enchanting little Woodson State Fishing Lake. It is surrounded by classic cross-timbers habitat, with dominant post and blackjack oak, big and little bluestem, sideoats grama, and Indiangrass. Upland bluestem prairie is prevalent in the adjacent Woodson Wildlife Area. On the east side of the lake the cool, wooded ravines are great for exploring. Ferns and mosses grow around the rocky outcroppings and clear pools formed by the dripping stream. The Chautauqua Hills is a fascinating sliver of sandstone hills no more than 10 miles wide that penetrates up into the Osage Cuestas from Oklahoma. Remnants of a sandy Pennsylvanian age river delta formed between 320 and 286 million years ago, this region features a rugged terrain of oak-bluestem savannas called the cross-timbers. Blooming redbuds and booming greater prairie chickens make spring a delightful time to visit. The predominant sandstone of the area was used in this ornate wall that runs the full length of the dam. 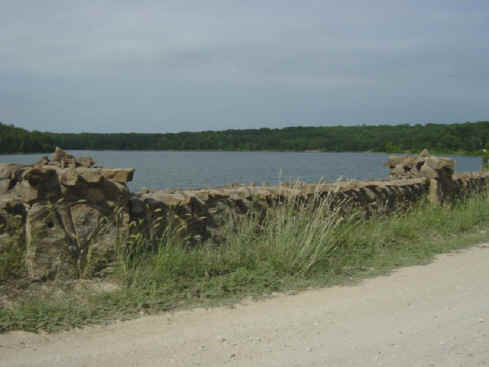 Woodson Lake was built by the Civilian Conservation Corps in the 1930's. It is known as Lake Fegan by old-timers. In March and April watch for lesser scaup, goldeneyes, and buffleheads on the lake. Survey the shallows for great blue herons and the mudflats for least sandpipers and lesser and greater yellowlegs. The woodlands and thickets are inhabited by a variety of woodpeckers and songbirds. In early spring, you may hear the song of western chorus frogs coming from the lake's edge. From May into summer, listen for northern cricket frogs and bullfrogs calling from the lake and gray treefrogs from the prairie and woodland edge. Examine rocky sites for lizards, skinks, and snakes. Be alert for copperheads! Painted turtles and sliders may bask on logs in the water. Tracks of opossum, raccoon, and deer are frequently seen on the mudflats. Watch for these secretive mammals in the twilight hours. Listen at night for the barred owl, chuck-will's-widow, and the "yip yip yeowww" of the coyote. A variety of damselflies and dragonflies frequent the lake, and butterflies are found in the woods and grasslands. In the woodland edge and open prairie you may see raptors, mourning doves, and upland plovers. Blinds are available for spring viewing of greater prairie chickens. Call the Toronto/Fall River Unit Office at Toronto State Park (620-637-2213) for arrangements. Picnic tables, Vault toilets, Grills, Drinking water, Dump station, Shelter house, Boat ramp. 30 camping pads and primitive camping. Click the icon to find a birding list for Woodson County. Directions: From Yates Center (90 miles east of Wichita) travel 7 miles southwest on U.S. 54. Follow the gravel road south 3 miles, then east for 1.25 miles. 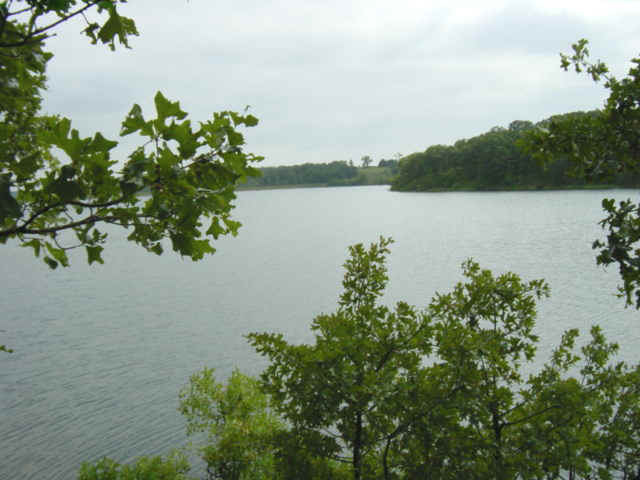 Ownership: The entity responsible for management of Woodson Lake is the Kansas Department of Wildlife, Parks & Tourism. Contact them at (620) 431-0380 if you have specific questions about use or management of this site. You may download the KDWPT brochure on Woodson State Fishing Lake from their web site.